The current version of ILookv8 can be downloaded following the instructions contained in the registration email. ILook is a multi threaded, Unicode compliant, fast forensic analysis tool designed to analyze an image taken from a seized computer system or other digital media. ILook will run on the following 32 bit platforms :- Win2K or WinXP and the following 64 bit platforms :- Windows XP / Server 2003. ILook can be used to examine images obtained from other forensic imaging tools that produce a raw bit stream image. It may also be used to examine some commercial imager formats. The hardware recommendation for ILookv8 is a 2 gigahertz Intel Pentium 4 processor with 1 gigabyte of RAM. ILook v8 contains "On-line help" sections which are available once Ilook is installed. IXimager help is included only with ILookv8 since the IXimager formats are proprietary to ILookv8. 3.An Explorer like interface allowing an investigator to view and navigate the file system as it originally appeared on the suspect's computer. 4.Granular extraction facilities which allow all or part of a file system to be extracted from an image. 5.Fast, sophisticated, regular expression search engine. 6.Link points to investigator defined viewer technology. 8.Password and pass phrase dictionary generators. 14.Data tagging and categorisation features. 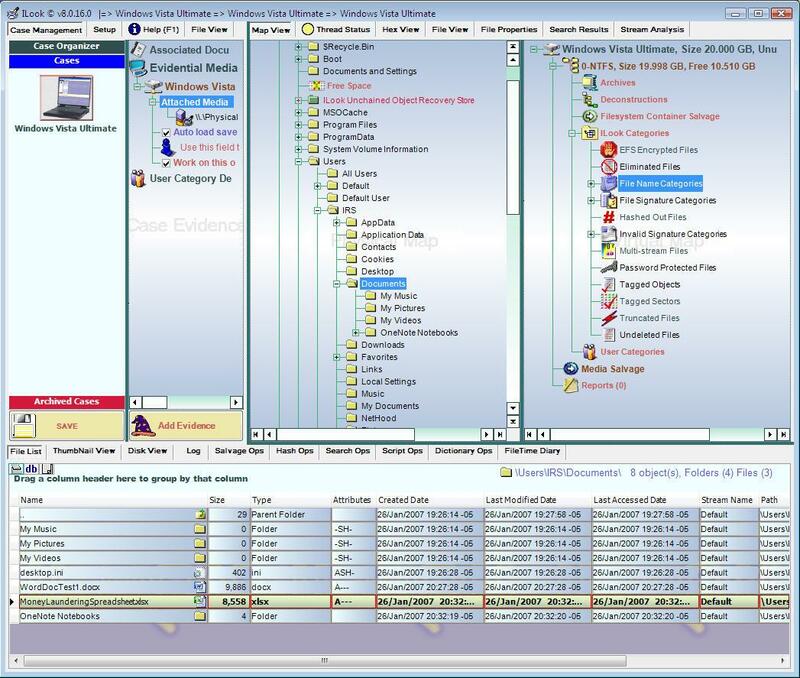 16.Case and evidence management features and multi-evidential item handling. 17.Internet cache and mailbox deconstruction functions. 19.Additional Imager built into ILook for imaging directly attached devices. 20.File filtering and elimination functions. 21.Search results database stores the results of all searches run against any item in a case. 22.Volume bitmap view gives detailed overview of the physical layout of any selected volume. 23.Sophisticated and powerful scripting for automating processes within ILook. 24.Full access to Microsoft's DotNet architecture, C# and VB.Net compilers linked to ILook's data streams for full user customisation. 25.New script types - ViewFilters and StreamFilters. 26.Protected file detection for common password protected filetypes. 31.New search and index engine.